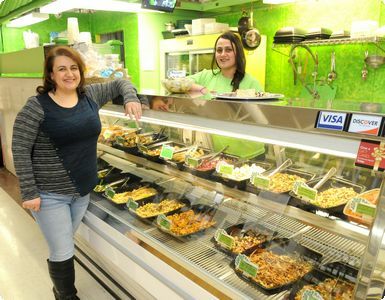 The names of the dishes offered by Foods of the Mediterranean are unusual, but that’s not the only reason the owners of the stand in Fairgrounds Farmers Market, Muhlenberg Township, list the ingredients on a sign for each one. Samirah and Jimmy Ghobrial of Macungie want to emphasize the healthiness of foods that come from a blending of their heritages. Customers will find traditional dishes from Turkey, Cyprus, Israel, Syria, Lebanon, Egypt and Greece. One example is koushere, a dish sold at carts on streets in Egypt, she said. It is made of lentils, chickpeas, rice, pasta, fried onion and homemade tomato sauce. The stand has a supply of take-home menus so customers can see the ingredients in other dishes, with names such as tabbouleh, burghl, megadara, fattoush and pastitsio, and decide what they want before going to the market. Familiar-sounding items on the menu include stuffed grape leaves, Greek salad, pita sandwiches, chicken kebabs and hummus. The stand also has desserts, beverages, soup and breads. Many of the items are suitable for vegetarians and vegans because they contain mixtures of beans, lentils, vegetables and grains, Samirah said. Workers at the stand will recommend different combinations of dishes for a meal, and mix salads together for customers. They will make dishes to order, eliminating ingredients a customer doesn’t like or want, or add meat to vegetarian dishes. Catering for events also is available. Talking about ingredients and menus doesn’t mean the family is willing to share recipes. It’s the proportions of the ingredients that make the difference, Samirah said. The location in the Muhlenberg Township market opened in May 2013. It is the family’s second. The other is in the Allentown Fairgrounds Farmers Market. To draw customers, the business provides discount coupons online. The website also has its menu, history and philosophy and links to health information. Cathy Beaver of Sinking Spring said she is a frequent customer at the local stand. Hearing customers say that sort of thing feels good, Samirah said. Plus, it’s an opportunity for their son, Christopher, 15, and daughter, Mariam, 12, to learn responsibility by working a few hours when they don’t have school or other activities, Samirah said. When your daughter loves to talk to the customers, and kids help, it’s nice, she said. “It makes them people-oriented,” Samirah said. “It builds their personality. My daughter loves to talk to the customers. This entry was posted in Featured by STRYV Creative. Bookmark the permalink.